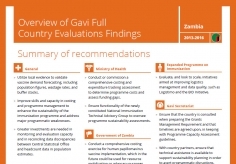 This report presents findings for Zambia from the 2016 Gavi Full Country Evaluations Annual Dissemination Report. The Gavi Full Country Evaluations (FCE) is a prospective study covering the period 2013–2016 with the aim of understanding and quantifying the barriers to and drivers of immunization program improvement, with emphasis on the contribution of Gavi, the Vaccine Alliance in four countries: Bangladesh, Mozambique, Uganda, and Zambia. This fourth annual dissemination report complements previous reports by providing key findings and recommendations for the 2016 evaluation period in the four FCE countries. The FCE encompasses all phases of Gavi support, from decision to apply, application and approval, preparation, and implementation in each of the relevant streams of support. Gavi Full Country Evaluations Team. 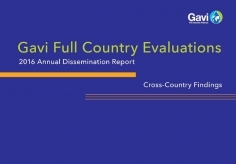 Gavi Full Country Evaluations: 2016 Dissemination Report – Zambia. Seattle, WA: IHME, 2017.